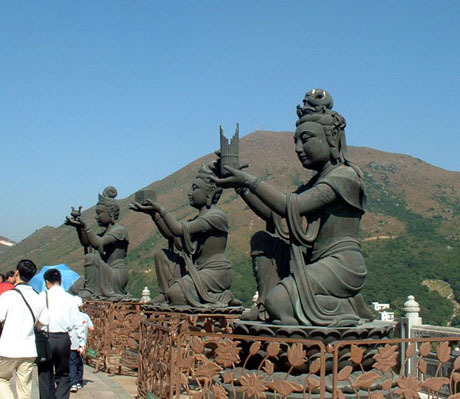 Ngong Ping, also known as "Ngong Ping Plateau" is a flat terrain of 102-hectares in the central part of Lantau Island, 460-metres above sea level. 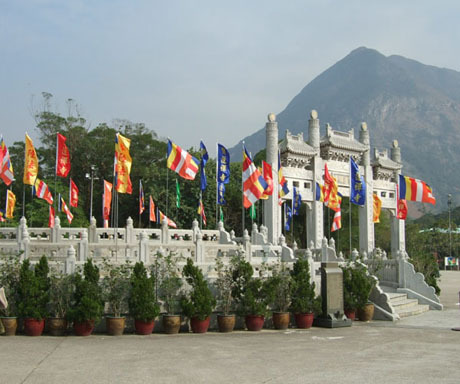 It is a scenic location with several religious sites flanked by mountains to the north, south and east, where Lantau Peak at 934-metres, Hong Kong’s second highest mountain towers above. To the west, the plateau faces the coast. Ngong Ping is the location of Po Lin Monastery, one of Hong Kong’s most famous Buddhist monasteries, founded in 1906, and once a remote and peaceful place. However, since the monastery opened its main hall in 1970, followed by construction of the adjacent Tian Tan “Big Buddha” statue in 1993 and Ngong Ping 360 cable car and Ngong Ping Village in 2006 it has become one of Hong Kong’s most popular tourist destinations. 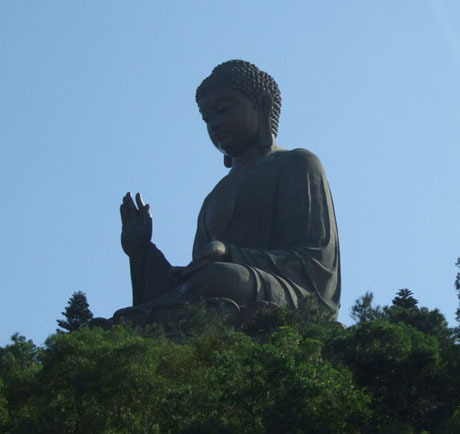 The Tian Tan (Altar of Heaven) “Big Buddha” statue was completed in 1993 having taken over ten years to construct at a cost of HK$60 million. It weighs 250 tonnes and was cast in 202 bronze sections in Mainland China by satellite and rocket manufacturers China Astronomical Industry Scientific and Consultative Corporation of Nanjing. 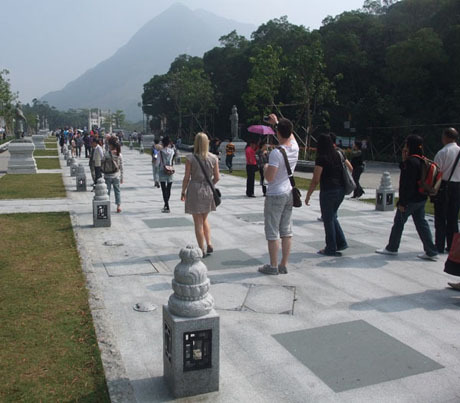 The castings were transported over a period of three years to Lantau, where it was assembled. The Buddha’s face was cast in a single section. The statue replaced an earlier Buddha statue on the site. The statue stands 26 metres high on a circular three-tier podium and is hollow, supported by a steel framework. It is claimed to be “the world’s largest seated outdoor bronze Buddha statue”. 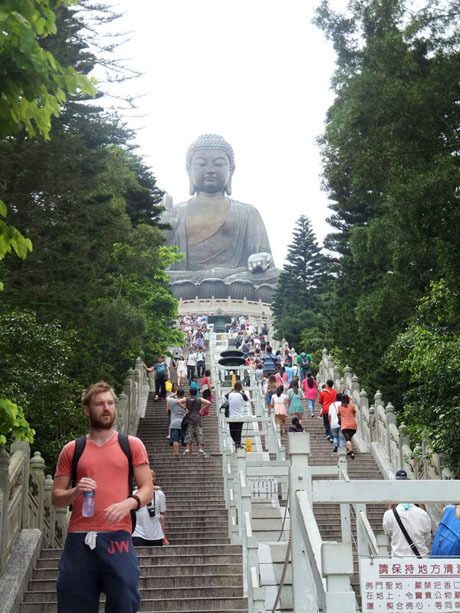 To reach the Buddha involves climbing some 268 steps to the lower tier of the podium. There is a less steep access road leading to the car park just below the lower tier, from where access to the Buddha podium is by either wheelchair ramp or a short flight of steps. However, the access road and car park are accessible only to tour coaches and authorised vehicles, but not taxis. 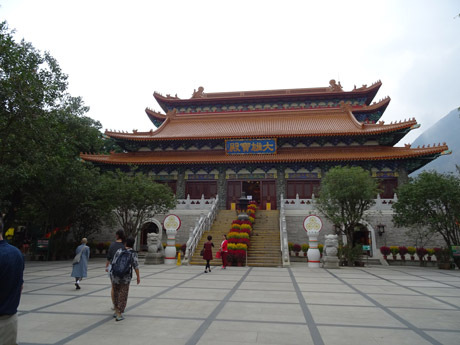 People with mobility difficulties who are unable to climb the steps can request assistance from the main office at adjacent Po Lin Monastery. Around the lower tier sit six two-tonne bronze Bodhisattva statues making offerings to the Buddha. The panoramic views from the podium are outstanding when the area is not shrouded in mist and cloud. Inside the podium underneath the statue is a museum on three levels, with exhibition halls, the Hall of Remembrance”, “Hall of Benevolent Merit” and “Hall of Universe”, where exhibits include a large bell with carved Buddha images, which is rung every seven minutes, 108 times daily to symbolise the clearing of 108 worries, oil paintings and Gautama Buddha relics. 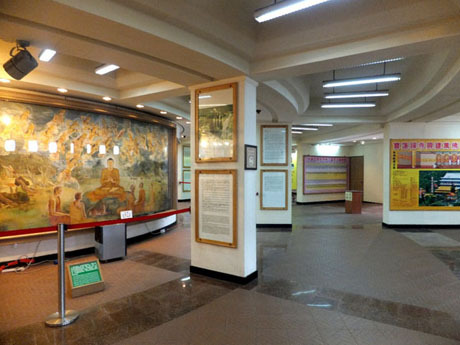 The highlight of the museum is the Buddha's bone relic on the third floor. The Buddha relic refers to the coloured crystals left after the Buddha entered paranirvana. There are three types of relic by colour. White is the bone relic, Black is the hair relic and Red is flesh relic. The bone relic worshipped at Po Lin Monastery was gifted to the monastery in 1992 by a famous monastery in Sri Lanka. Photography is not allowed in the museum and the Buddha relic is viewed from a distance. The Buddha statue is open daily from 10am to 5-30pm. Admission to the Buddha is free. 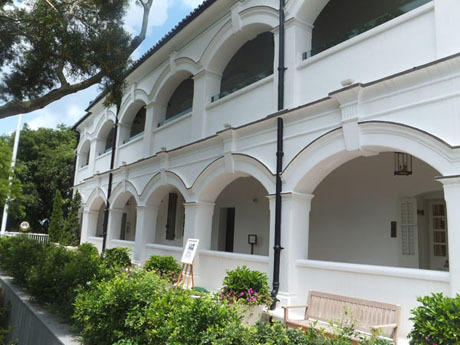 Entry to the museum costs HK$30 but tickets include an ice cream and bottle of water from the snack bar at the Deli Vegetarian Cafe at the adjacent Po Lin Monastery. Meal tickets (HK$78 for standard meal or HK$118 for De-Luxe meal at May 2013) for a vegetarian meal at the Po Lin Vegetarian Restaurant at Po Lin Monastery (see below) include entry to the museum. 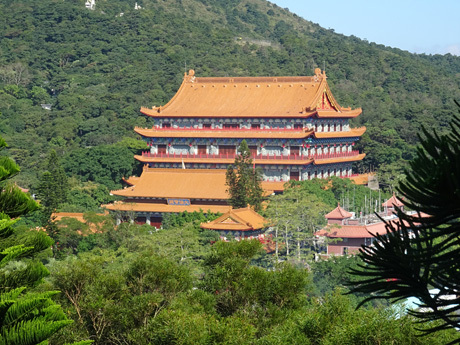 The monastery was founded in 1906 by three Zen masters of Jin Shan Monastery of Zhenjiang, Jiangsu Province in China who had travelled south to Lantau Island to spread the Buddhist doctrine. The monastery was originally simply a stone thatched house without a name but as more and more monks gathered there a large hut was built to accommodate them. At the invitation of the three Zen masters, Monk Jixiu of Jin Shan Monastery became the first abbot in 1924 changed the name of the hut to “Po Lin Monastery”, Po Lin meaning “Precious Lotus”. One of the monastery's former abbots was the eminent monk Venerable Fat Hot (1893-1972), who was appointed in 1930 and expanded the monastery greatly. In December 1941, when Hong Kong was under Japanese occupation and the monastery was desperately short of food, Venerable Fat Hot travelled to Guangzhou to publicise Buddhism and beg for alms and during this time founded the Hong Kong Buddhist Association and established a charitable school and Buddhist hospital. He resigned as abbot in 1952 but resumed the post again one year later. Venerable Fat Hot died in 1972 and is buried in the mountain at the back of the monastery. Since then, the monastery has further and been a major draw for tourists and locals since its main hall opened in 1972. Construction of the Tian Tan Buddha statue, which was completed in 1993 and the opening of the Ngong Ping 360 cable car system and Ngong Ping Village in 2006 have made it one of Hong Kong's busiest attractions and a further major expansion, completed in late 2014 includes the large five storey Grand Hall of Ten Thousand Buddhas has been under way since 2007. 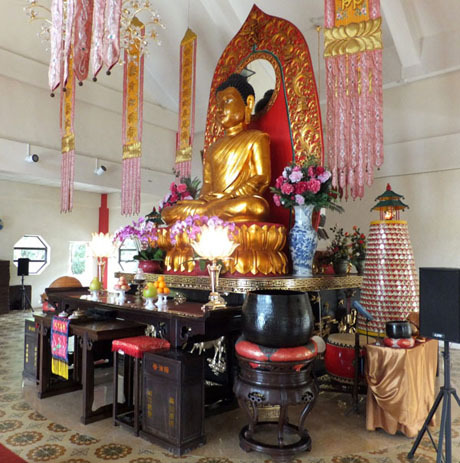 A grand opening ceremony of the new temple took place in December 2013, to celebrate the 20th birthday of the “Big” Buddha statue, and the temple finally opened to the public in October 2014. The monastery is currently home to about 100 monks and nuns. At the entrance to the monastery is large triple arch white stone "Mountain Gate" pai lau adorned with three pagoda statues leading to a wide approach pathway lined with bauhinia. This pai lau has been part of the monastery ever since it opened and has been moved several times. A second pai lau was erected in 2010 as part of the Ngong Ping Piazza development. 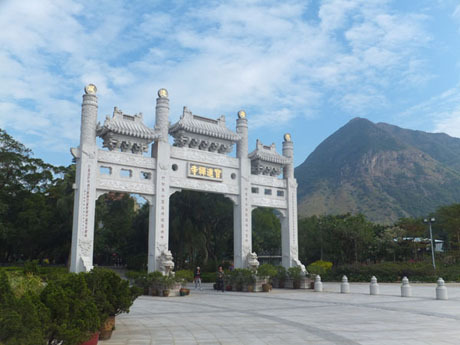 The original triple-arch stone "Mountain Gate" pai lau at the entrance to the monastery at Ngong Ping Piazza. 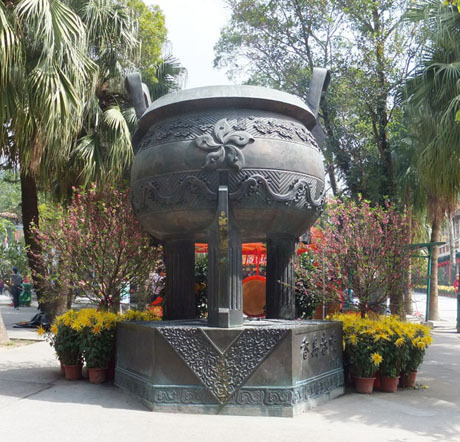 Along the path from the piazza to Po Lin Monastery is a 4.1 metre cauldron seated on a pedestal. The Reunification Cauldron was erected in 1998 and commemorates the end of British sovereignty and return of Hong Kong to the motherland a year earlier. The cauldron is engraved with the pattern of the Bauhinia, the national emblem of Hong Kong. The cauldron was originally located in Di Tan Square but was moved to its present location during construction works for the piazza. Just beyond is the two storey Welto Temple where visitors are greeted by the smiling Maitreya Buddha with Welto Bodhisattva behind. This temple acts as a sentinel for the main temple, Hall of Great Hero, beyond. Separating these temples is a colourful courtyard with pavilions, flowering trees and lotus pond. 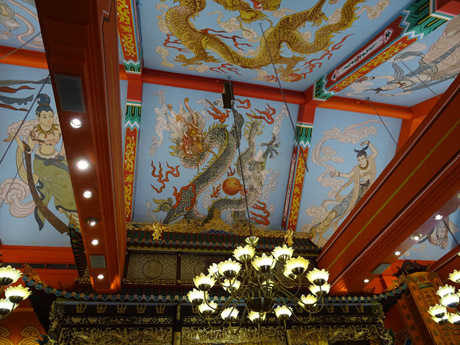 The Main Shrine Hall of Buddha was completed in 1970 and is protected by a pair of stone lions. Steps lead up to the main hall where three large Buddha statues sit. These are Sakyamuni Buddha (the present Buddha), Bhaisajyaguru Buddha (the past Buddha) and Amitabha Buddha (the future Buddha). Sakyamuni Buddha is flanked by two attendants, Mahakasyapa and Ananda. 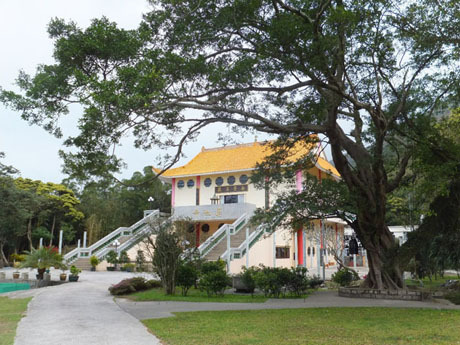 A number of smaller temples at the rear of the main hall have been demolished in recent years to make way for the huge “Grand Hall of Ten Thousand Buddhas” and “Seven Treasures Lotus Pond”, which were completed in October 2014. The Grand Hall will contain ten thousand Buddha statues, Scripture Library, Abbot’s Chamber, Dharma Hall, Permanent Ordination Hall, 3000 square-metre Exhibition Hall for precious Chinese and Buddhist relics and artefacts and a multi-purpose hall. It will also be the venue be used for study of scriptures and Buddha teachings and for teaching, contemplation and practice of Dharma and religious disciplines are taught, contemplated and practiced as well as being a platform for traditional, historical, cultural, and educational and tourism promotional activities. 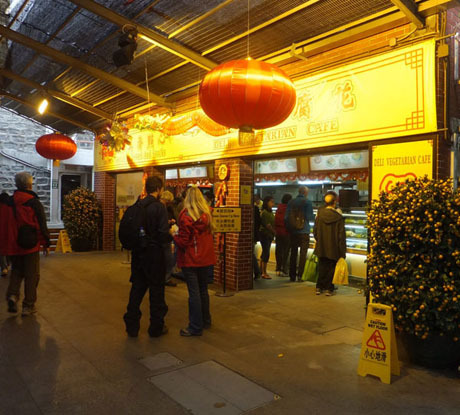 Po Lin Vegetarian Restaurant is situated at one side of the courtyard and meal tickets can be bought at the entrance or as a combined ticket inclusive of entry to the Big Buddha exhibition halls. As at November 2017 "General Meal" (standard vegetarian meal) costs HK$110, De-Luxe meal costs HK$150. Deli Vegetarian Café is located adjacent to Po Lin Vegetarian Restaurant, offering take away snacks which can be eaten at tables in the covered outdoor area outside the restaurant. 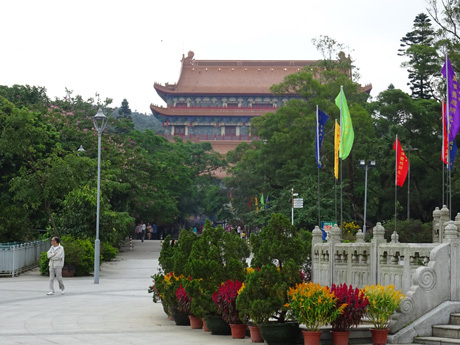 Po Lin Monastery is open daily 8am to 6pm and entry is free. Deli Vegetarian Café open from 11-30pm to 4-30pm daily. 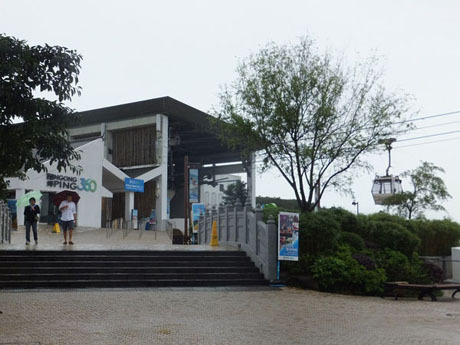 Opened in 2006 at the same time as the Ngong Ping 360 Cable Car system, Ngong Ping Village is the location of the Ngong Ping Cable Car Terminus, which links the village with Tung Chung. Cable cars carrying up to a maximum of 17 passengers arrive at the terminus with cabins arriving about every 30 seconds. 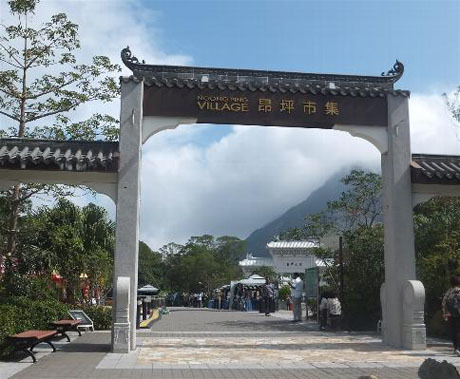 The village is a highly commercialised “culturally themed” village in traditional Chinese architectural style just a short walk from the Po Lin Monastery and Tian Tan Buddha Statue. 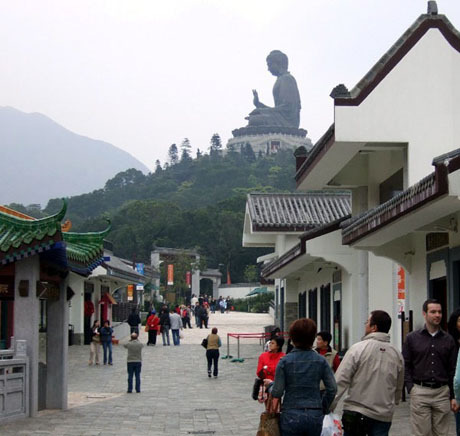 Ngong Ping Village lies in the shadow of the "Big Buddha"
The village has two multi-media theatre shows, Boddhi wishing tree, gift shops, restaurants and café’s and occasional street entertainment. The village is open Monday to Friday 10am to 6pm, weekends and public holidays 9am to 6-30pm. “Walking with Buddha” is an audio-visual presentation depicting the life of Siddhartha Guatama, the man who became Buddha and follows his journey along the path to enlightenment. “Monkey’s Tale Theatre”, is a comic animation based on the famous Buddhist Jakata stories. The theatre closed on late 2013 and is being replaced by a new XD theatre attraction in 2014. Entry fees of HK$36 adult, HK$18 child appies to the “Walking with Buddha” attraction. 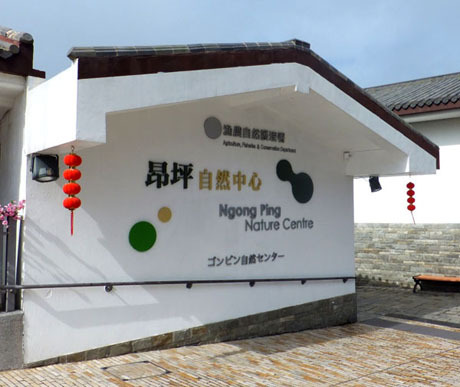 Ngong Ping Nature Centre was established by the Agriculture, Fisheries and Conservation Dept and seeks to promote public awareness of environmental and ecological conservation of the island through displays which are in English, Chinese and Japanese languages. There are free daily guided nature tours from the centre although there is currently only one daily tour conducted in English. Ngong Ping Garden Restaurant is a large Chinese restaurant on two floors specialising in Cantonese and Chiu Chow cuisine. 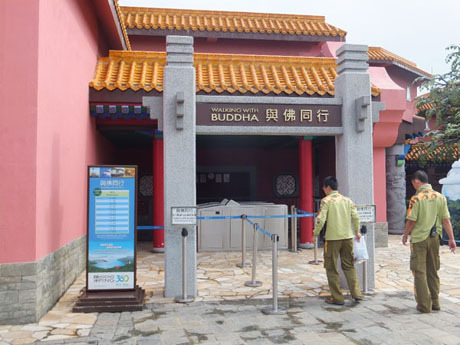 A recent development linking Ngong Ping Village with other tourist attractions at Ngong Ping including the "Big Buddha", Po Lin Monastery and Wisdom Path is Ngong Ping Piazza, completed in July 2010 as part of a programme to enhance public facilities at Ngong Ping. The piazza, which was almost two years in construction and cost some HK$77.5 million, is intended to harmonise with the religious setting of the surrounding environment and includes a new 14.1 metre tall, 19.1 metre wide Pai Lau, 122 metre long Bodhi Path flanked by statues of the "Twelve Divine Generals". Below the Buddha in Ngong Piazza is Di Tan (the Altar Of Earth), a circular granite podium with four lotus ponds, where the monastery holds major ceremonies. Di Tan is connected to Tian Tan (the Altar of Heaven) by the 268 steps leading to the Buddha. with four lotus ponds. The piazza also has a 1,980 sq metre Chinese landscaped garden and pavilion. Located alongside the path from the “Big Buddha” to the Wisdom Path, the tea plantation was established in 1947 by Brook Bernacchi, a prominent British barrister and politician, the first European to settle on Lantau Island and son of the explorer Lieutenant Commander Louis Bernacci who accompanied Robert Falcon Scott to the Arctic as well as his own expeditions to Antarctica and South America. 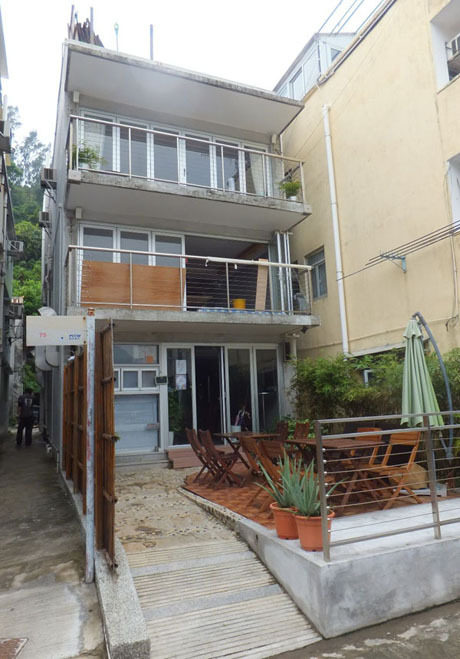 Brook Bernacci had purchased a small nunnery at Ngong Ping and turned into his home, which can still be seen behind the Tea Gardens Restaurant. He established Hong Kong’s only tea plantation nearby to give work to released prisoners and sold his tea under the “Lotus” brand name. However, the business was never very successful owing to competition from mainland tea growers. During the late 1980's and early 1990's there were horses for hire and an outdoor skating rink, in notoriously poor condition, at the tea gardens. 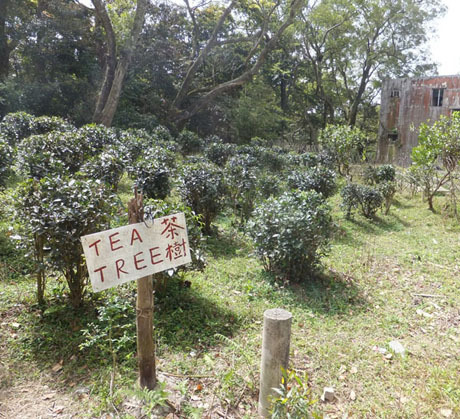 Brook Bernacci died in 1996, age 74, and the tea gardens were taken over by a local contractor but his home can still be seen behind the restaurant and the tea plants continue to grow today. 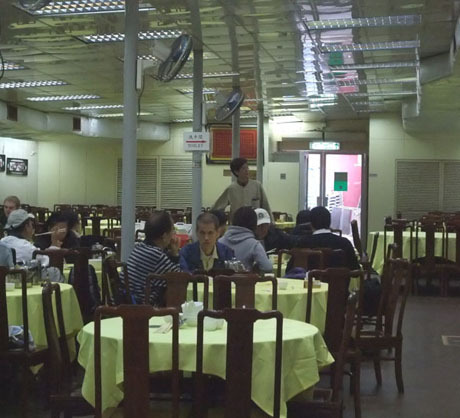 The Tea Garden Restaurant, offering noodles and simple snacks, seems to operate erratic opening hours and is usually closed on weekdays but is sometimes open at weekends and on public holidays. 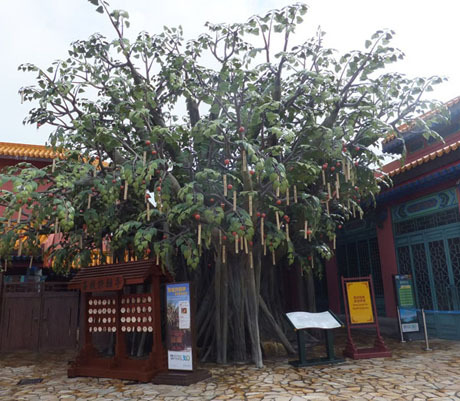 Opened in 2006, the “Wisdom Path” comprises 38 vertical wooden columns (half tree-trunks), 8-10 metres tall and 1 metre wide, with inscribed 260-word verses from the Chinese version of Heart Sutra, one of the world’s best known prayers, revered by Buddhists, Taoists and Conficians alike. The pattern arrangement of the columns forms the symbol for infinity. Each column has a portion of a 260-word prayer inscribed on it and visitors follow the path around the columns, whilst reflecting. The Wisdom Path can be located by following the well signed path which runs between the monastery and Buddha Statue, for about ten minutes past the Tea Gardens Restaurant. 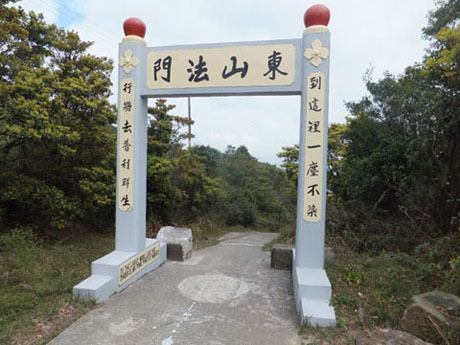 Immediately beyond the entrance to the Wisdom Path, is an ornamental archway which marks the beginning of Stage 3 of the 70km Lantau Trail. 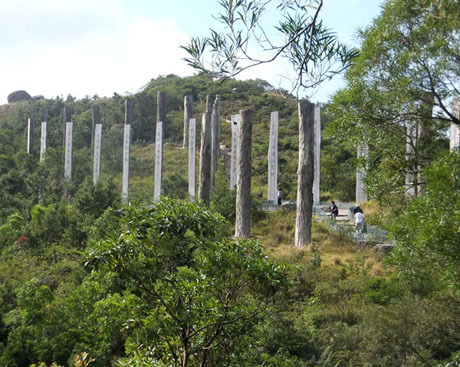 Just beyond the archway is a viewing platform with views over the forested slopes to Shek Pik Reservoir and the south Lantau coast. Beyond the viewpoint the trail leads uphill to the towering Lantau Peak (also known as Fung Wong Shan and Phoenix Mountain), about one hour of mostly strenuous walking mostly via steps, from where on a clear day there are spectacular panoramic views as far as Macau. About 400-metres northwest of Po Lin Monastery on a scenic, tranquil site at the foot of mountains, Lotus Pond Temple is located at the site of Lin Chi Monastery which was established in 1921 by the Venerable Shi Ru. 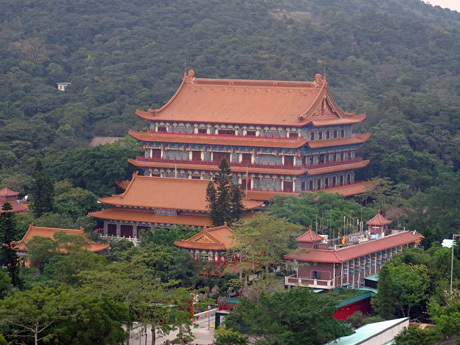 Since April 2011, Lotus Pond Temple has been the home of the Plum Village Foundation (Hong Kong) and, since 2012, the Asian Institute of Applied Buddhism (AIAB). The monastery is spread over a wide, flat area with a number of buildings. The attractive main temple, Lotus Pond Temple, built in 1991, is a two-storey building with external stone staircases on both sides leading to the Amitayus Buddha Hall in the upper storey. On the lower storey is the “Laka Guanyin” and a broad square in front of the main hall. The Lotus Pond Temple is a monastery for nuns, whilst the nearby Bamboo Forest Monastery (Chu Lam Ching Yun), also part of AIAB, is a monastery for monks. Weekly activities are held, which the public can attend and the monastery offers residential meditation retreats. 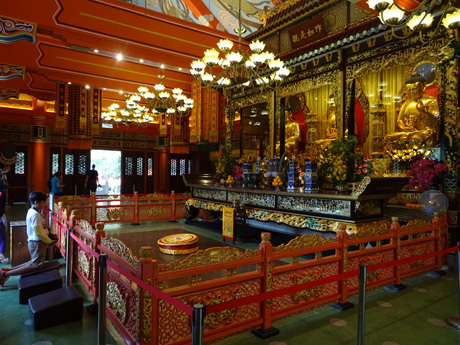 Although only a short walk from Ngong Ping’s other attractions, this temple, in complete contrast, is a quiet and peaceful retreat which is “off the beaten track” for most tourists. Lotus Pond Temple can be reached by following Lin Ping Drive (just ahead of the bus drop-off point at Ngong Ping) a short distance and then taking the path immediately on the left after Cheung Kee Café. The entrance gate is usually closed to keep out feral cattle but visitors are welcome to enter and look around the temple although there may be some restrictions when events are taking place. 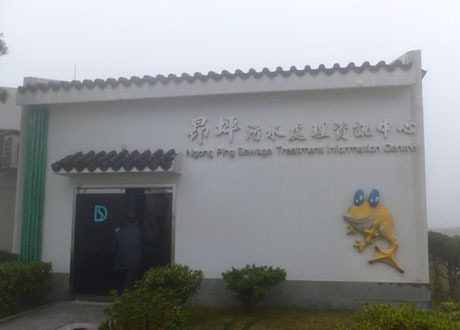 Commissioned by the Drainage Services Department in 2006 and located on Ngong Ping Road, next to Ngong Ping Village, the treatment works serve a population of 40,000 including residents of Ngong Ping and tourists. The plant treats about 450 cubic-metres of sewage a day and consumption of reclaimed water from the plant is about 140 cubic-metres a day. 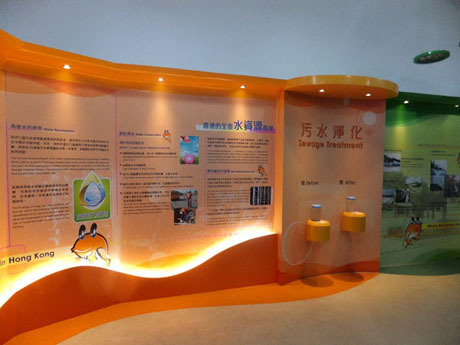 It has an information centre with small exhibition and fish ponds which use treated water from the plant. The information centre is open to the public (free admission) on Tuesdays to Sundays from 10am to 12-30pm and 1-30pm to 4-30pm. It is closed on Mondays, New Year's Day, the first three days of Chinese New Year, Good Friday, Christmas Day and Boxing Day (Dec 26th). NGONG PING 360 CABLE CAR - Ngong Ping Village is the upper terminus of the Ngong Ping 360 Cable Car service, linking the village with the town of Tung Chung near Hong Kong International Airport. The spectacular ride 5.7km ride across Tung Chung Bay and of Lantau Island takes 25 minutes. Operating hours on Monday to Friday are 10am to 6pm, Saturdays, Sundays and public holidays 9am to 6-30pm. 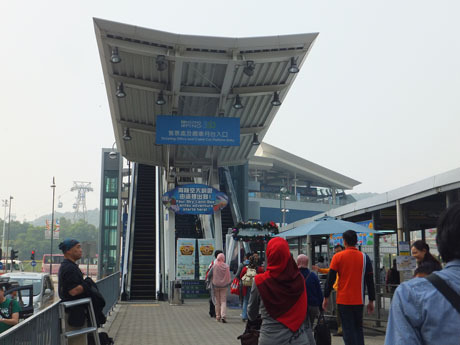 Tung Chung Cable Car Terminus is located about 3 minutes walk from exit B of Tung Chung MTR Station. From Hong Kong International Airport, Tung Chung Cable Car Terminus is served by shuttle bus S1 (jointly operated by Citybus and Long Win Bus) from Cheong Tat Road outside the Terminal 1 Arrival Hall. The bus operates at about 5 minute frequency and the journey to the cable car terminus takes about 10 minutes. 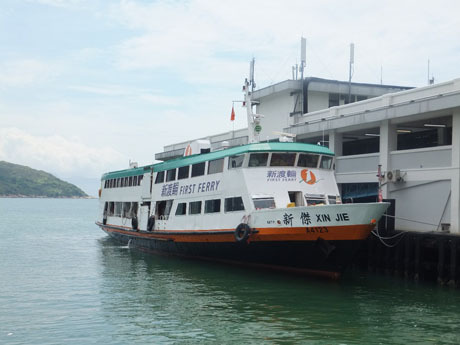 From Tung Chung, Lantau Island - New Lantao Bus No 23 – Journey time about 50 mins. An alternative to the cable car. 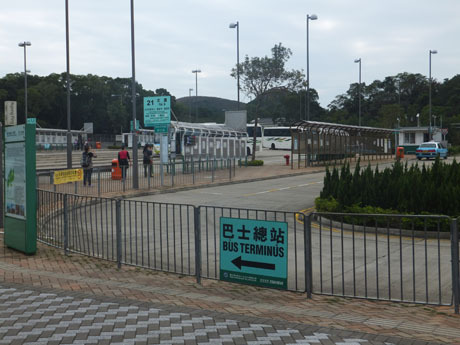 The bus terminus at Tung Chung is about 3 minutes walk from exit B of Tung Chung MTR Station, located between Citygate Outlets mall and Tung Chung Cable Car Terminus*. *There is an additional charge of HK$6 for each item of large luggage carried in the taxi boot. 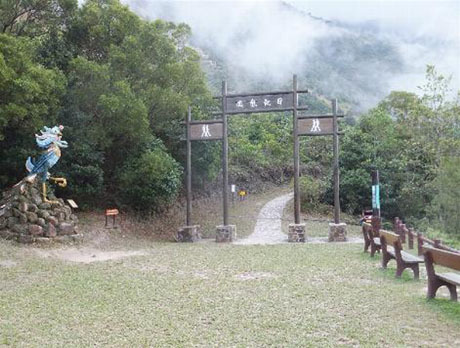 There are a number of popular scenic walking paths in the area and energetic visitors with 3 or 4 hours to spare can walk to Tung Chung as an alternative to public transport. 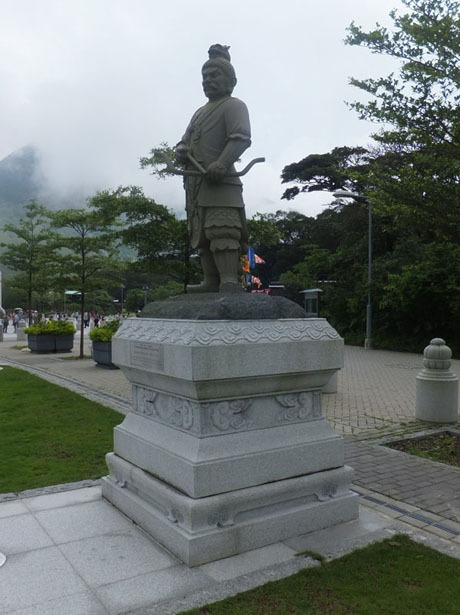 These include a picturesque walk down the TUNG CHUNG VALLEY PATH alongside forested hills, streams, pavilions and shrines through ancient Tei Tong Tsai Village and Po Lam and Lo Hon monasteries which also allows the opportunity to visit Tung Chung Fort on the way. The walk is along concreted paths and is signposted from just beyond the Tea Garden Restaurant. To walk to Tung Chung Town Centre takes about two hours but the walk can be shortened to about 90 minutes once Tung Chung Road is reached where buses to Tung Chung and Mui Wo are available. Just beyond the Tea Garden Restaurant, follow the path on the left signed "Tung Chung Town Centre" and about 8 minutes walking beyond is reached this cement gate at the beginning of the descent through the Tung Chung Valley to Tung Chung. 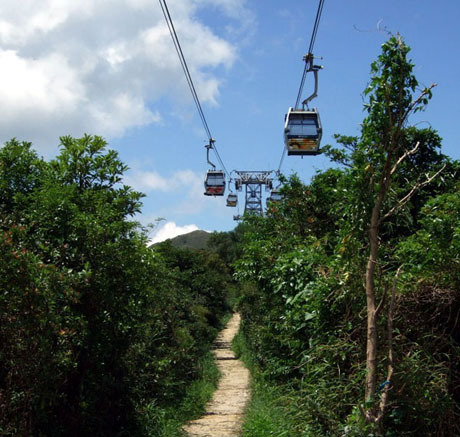 A walk with a difference is the 5.7km NGONG PING 360 RESCUE TRAIL, which includes a short section of the Lantau Trail, and starts at the path leading off the service road just below the cable car terminus at Ngong Ping Village. This is a spectacular walk along the mountain tops under the path of the cable car and alongside the cable car towers and angle station. Construction of this trail in the mountainous terrain was a major challenge and six mules were brought in from Canada to assist in transporting materials. The trail comprises concrete paths, steps and timber boardwalks. There are some steep sets of steps to climb approaching some of the cable car towers and on valley sides and there are some undulating sections but much of the trail is level until reaching the rapid descent via steps down from Tower 3 to Tung Chung Bay. 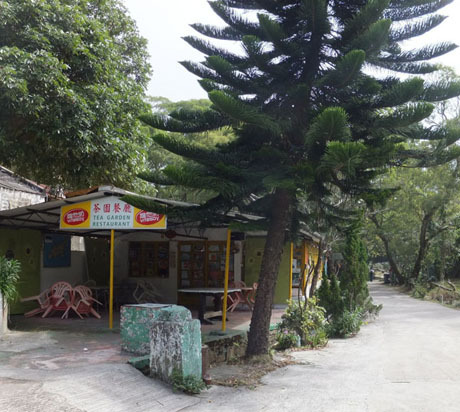 Allow 3.5 hours to walk to Tung Chung Town Centre by this route although again the walk can be shortened by taking a bus from Tung Chung Road near Tung Chung Fort or Yat Tung Estate. SOLO LODGE GUEST HOUSE - Two 2-bedroom houses accommodating up to 4 people and one 2-bedroom guest house accommodating 4-6 people. Kitchen facilities, BBQ, bicycle, cot. Rates from HK$300 up (1- bedroom Sunday to Friday) to HK$900 (2-bedrooms Saturdays and public holidays). Owners also operate Solo Cafe. Reception - 86 Kat Hing Front Street, Tai O.